Today, MoAA is very proud to present Tamatha Hollingsworth! I met Tammy at a Local Author Book Fair at the Cascades Library earlier this year. Technically, I met Cora first, while all us big people were setting up our booths. Imagine my surprise when I discovered she was THE Cora from Taye and Cora Save the Earth! My very own local celebrity sighting! I really love Tammy’s fresh approach to children’s writing and her bright, optimistic outlook on life. I’m sure after you read this interview, you will too! Tamatha Hollingsworth: The best thing about writing is waking up that inner child to help tap into an imaginary world, with imaginary characters. 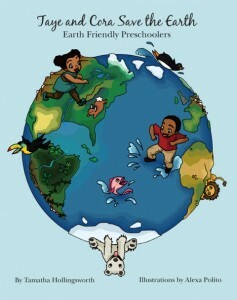 My first book Taye and Cora Save the Earth introduced children to the basics of conservation. My most recent endeavor The Vegineers really taps into the reader’s imagination by entering into a world full of good and bad garden bugs. TH: Sometimes waking up your inner child isn’t very easy. The inner child could be grumpy and doesn’t want to be bothered with imagining. Writer’s block is the worse. There are days when I have writing ideas that are coming so fast I have to pull my car over and write them down, and other times I could be sitting on my back porch with my laptop ready to go and I get nothing. TH: Writing is like taking a journey to an undiscovered imaginary world where there are no boundaries. TH: I would be in Bora Bora lying in a tikki hut that sits over the crystal blue water a few feet from the white sandy beach. I’ve actually never been to Bora Bora, but those pictures always look so serene. But more realistically, I write best on a Sunday morning, outside on my back porch, overlooking the trees and the garden, sipping a cup of tea. TH: The palm tree because I think this is the way we should live our lives. The palm weathers storms and winds, but only bends and never breaks. When the storm is over, like the palm, our roots will be stronger and we learn from the experience. TH: My senior year of high school I was voted most athletic, I was on the honor roll, and thought I was good at writing rap music. What I liked about writing rap music was the rhyming. My first draft of my latest children’s book, The Vegineers, was in rhyme. Writing a children’s book in rhyme was a big challenge. The meter and rhythm have to be pretty much perfect, and you can’t force words just for the sake of rhyming. After several edits, and a year later, I gave up and wrote the book in prose. TH: Take charge of your own destiny. Most people don’t feel like they have time to write a book. But, once I got off Facebook and turned off the TV, I found I had much more time than I had ever realized. Tamatha Hollingsworth lives in Virginia with her husband and two children. She is a Certified Public Accountant and Finance Director at George Washington University. Her first book “Taye and Cora Save the Earth” was inspired as a keepsake book for her children that included their images and names while teaching them basic conservation tips. She hopes her second book “The Vegineers” will inspire children and adults to not only eat vegetables, but to choose natural ways to protect gardens. She enjoys creative writing, running, and biking with her family. This entry was written by Lesley Fairy and posted on July 19, 2013 at 7:00 am and filed under Interview. Bookmark the permalink. Follow any comments here with the RSS feed for this post.